Outside of a monitor, your mouse and keyboard are the most important things connecting to your PC gaming experience, which is why it’s important to have quality under your fingertips. A mouse is especially important. A bad mouse won’t last long, will be uncomfortable to use, and will prove unreliable when you put it under stress. Worse still, a bad wireless mouse will suffer from a poor battery life, and a laggy, unreliable connection. Thankfully you can avoid all those issues with a quality mouse, and one of the best mice around is currently almost 50% off on Amazon. thanks to Amazon's ongoing Black Friday deals. 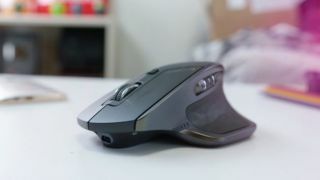 The mouse in question is the Logitech MX Master, which we currently rank as the second best mouse in the world behind the portability-focussed MX Anywhere. You can currently buy the MX Master for £41.99 on Amazon, which is a far cry cheaper than its regular asking price of £79.99. Thankfully keyboard fans don’t have to be left out in the cold, as one of Logitech’s flagship keyboards, the G910, is also on sale at £79.99. It’s also got a full set of RGB backlights, and a selection of macro keys if you want to simplify your gaming experience by assigning a complicated series of key presses to a single button.